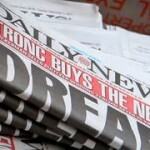 In New York City, the new owner of the New York Daily News says it will fire half the staff of the longtime newspaper. Among those who were fired was editor in chief Jim Rich, who tweeted, “If you hate democracy and think local governments should operate unchecked and in the dark, then today is a good day for you.” In the 1980s, the New York Daily News employed 400 journalists. After the latest firings, the newspaper will have only 45 people in its newsroom staff. The New York Daily News’s owner, Tronc, is also the publisher of The Chicago Tribune, the Baltimore Sun and the Hartford Courant. Democracy Now!’s Juan González was a longtime columnist for the New York Daily News. Last week a Russian gun rights activist named Maria Butina—who had direct ties with the NRA—was charged by the Justice Department with acting as an unregistered agent of the Russian government. She was arrested in Washington, D.C. as she was preparing to go back to Russia. Butina is accused of trying to infiltrate the NRA and other right-wing groups. Butina worked for the Russian banker Alexander Torshin, a longtime friend of the NRA who now serves as the deputy head of the Russian central bank. In January, McClatchy reported the FBI was investigating whether Torshin illegally funneled money to the NRA to help Trump. The NRA spent more than $30 million to help elect Trump—more than twice what it spent on Mitt Romney’s run in 2012. A federal judge has delayed the start date for the trial of former Trump campaign chair Paul Manafort, who faces charges of tax fraud, bank fraud, money laundering, witness tampering and failing to register as a foreign agent. His trial will now start on July 31; it had been slated to start on July 25. The judge also agreed to grant immunity to five witnesses who are expected to testify in Manafort’s trial. Nearly one year since hundreds of torch-bearing white supremacists held a deadly march and rally in Charlottesville, Virginia, Homeland Security Secretary Kirstjen Nielsen has reiterated Trump’s defense of the violent white supremacists, saying, “I think what’s important about that conversation is, it’s not that one side is right and one side is wrong. Anybody that is advocating violence, we need to work to mitigate.” Organizers from Unite the Right, the group that held the rally in Charlottesville, have announced they will hold a repeat rally on the anniversary of last year’s deadly event, with plans to descend on Washington, D.C.